The beasts are back! Calling all science geeks, nature freaks, and rogue geniuses! Your stuffed squirrel got game? Got a beaver in your brownstone? Bring your beloved beast to the Bell House and enter it to win! 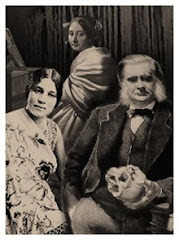 Eligible for prizes: Taxidermy (bought, found, or homemade), biological oddities, articulated skeletons, skulls, jarred specimens—and beyond, way beyond. 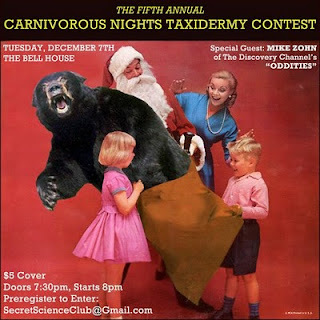 The contest will be judged by our panel of savage taxidermy enthusiasts, including Robert Marbury of the Minnesota Association of Rogue Taxidermists; Dorian Devins, co-founder and curator of the Secret Science Club; and beast mistress Melissa Milgrom, author of Still Life: Adventures in Taxidermy. SPECIAL GUEST: Purveyor of scientific wonders and star of the inimitable new show Oddities on the Discovery Channel, Mike Zohn joins the judging panel and presents an illustrated lecture on (yes!) taxidermy. Entrants: Contact secretscienceclub@gmail.com to pre-register. 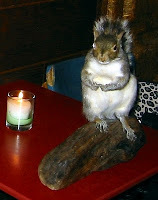 Share your taxidermy (and its tale) with the world! Spectators: Don't miss a beastly second of this wild night! Amazing- Wish I was in that neck of the woods. I'll promote it on my site, and hopefully I can make it next year! Post will be going up on HeyRubeCircus.com on 12/9. Have fun! Sorry, I read the date wrong. I'll put up the post today.